As you might notice, StarWind VSAN now supports VMware VVOLS. 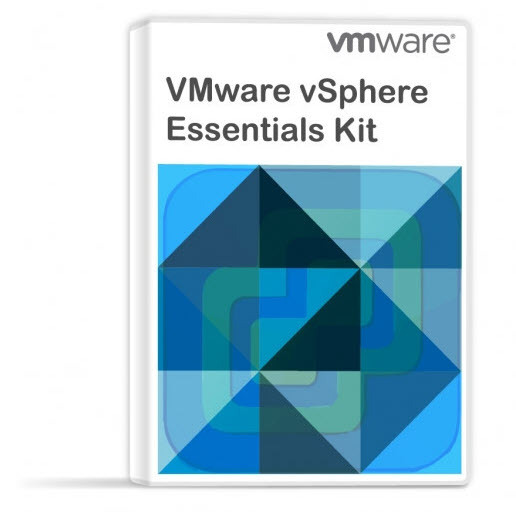 If you’re new into VMware VVOLS, you should perhaps check some VMware documentation, or we have an article about storage and VMware VVOLS as well. Virtual volumes are object exported by a compliant storage system. vVOLs correspond one-to-one with a VMs disk and other VM related files. No more datastore management. vVOLs are mapping virtual disk, snapshots, and replicas, directly to objects, which we call virtual volumes, on a storage system. This mapping allows vSphere to offload intensive storage operations (snapshots, cloning, replication) to the storage system. When creating a volume for each individual virtual disk, it is possible to set policies more granularly, more optimal. 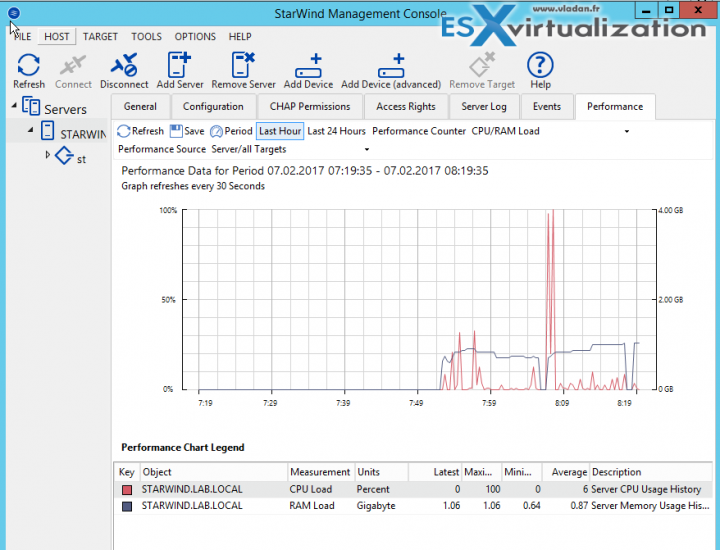 StarWind VVOLs allows you to create two capability profiles. There are a standalone embedded preconfigured profile and highly available profile. Capability profiles define performance and capacity specifications of the VVols datastores. Information like the type of storage, caching and provisioning method can be found at profiles. StarWind VVols provides the VVols functionality to VMware vSphere Cluster interacting as Storage Provider. VVols Datastores connected to vSphere Cluster are presented by StarWind Cluster Service that handles all the storage operations. Overview of the architecture. Screenshot from StarWind. When a virtual volume is created, it is assigned a storage policy profile. The VVols datastore will show as compatible storage in vCenter or the vSphere Web Client if the associated capability profiles meet VMware storage policy requirements. There is a step-by-step guide at StarWind website. We can show a screenshot from that guide below. Link. StarWind VVols makes storage management and provisioning highly efficient, transparent and automated by presenting each virtual machine and its disks as an atomic manageable infrastructure unit. 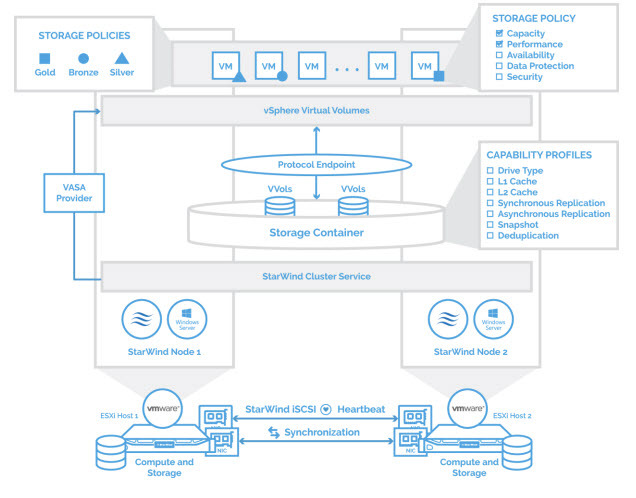 With the integration of vSphere storage management technologies, StarWind Appliances provide VMware administrators with full capabilities of enterprise storage management. By creating VVOL datastore you’ll be able to assign performance and availability capabilities to your VMs (disks) on more granular fashion. With StarWind VSAN you are able to configure HA VVols Datastore by registering a StarWind VASA Provider in VMware vCenter Server. So vCenter and StarWind storage can better communicate and better use the provided storage.